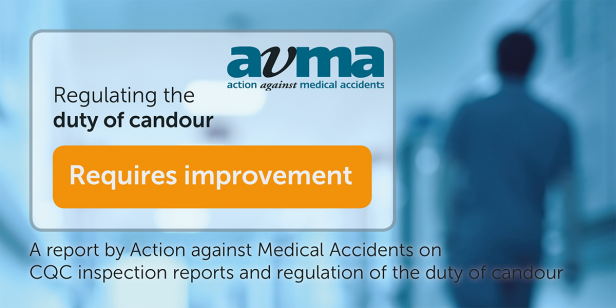 Independent research carried out by AvMA shows that the Care Quality Commission (CQC) “requires improvement” in how it regulates the statutory duty of candour. This is despite significant improvements since AvMA’s previous report in 2016. The CQC has used its statutory enforcement powers 108 times against providers who were not fully compliant with the duty of candour (no examples at all were given in 2016). The quality of CQC inspections of NHS trusts and the resultant reports has significantly improved since 2016. NHS bodies appear to be improving their implementation of the duty of candour overall, but there remains considerable variation and confusion about the requirements. The CQC has no idea of how many individual allegations about organisations breaching the duty of candour it receives and no system in place to ensure that allegations, indicating serious breaches, are dealt with. CQC inspections are still very inconsistent in how thoroughly they assess compliance with the duty of candour. Of the inspection reports reviewed, 5% do not even mention the duty of candour, while another 8% address it only superficially. Some reports indicate less than full compliance with the duty but do not even make a recommendation. Where the CQC has used its statutory enforcement powers, it appears to have done nothing to publicise the fact. This is a missed opportunity to send a clear message to other providers about the importance of complying and to increase public confidence in the CQC itself. “This research shows that the CQC is taking the duty of candour more seriously since our last report and regulatory action has resulted in 108 cases. However, there remain serious weaknesses in its approach. “How can any inspection of an NHS trust ever fail to look at duty of candour (a ‘fundamental standard’) at all? How can identified failures to comply fully not result in a recommendation, let alone regulatory action? How can the regulator still have no system in place to assess allegations of breaches of the duty or even record the number of them? Ensuring consistently high quality training on duty of candour is rolled out across England. The report is based on an assessment of CQC inspections of NHS trusts carried out in 2017 and information acquired by virtue of a Freedom of Information request and further enquiries with CQC staff. AvMA would like to thank staff at the CQC for their help and co-operation, and Daniella Negri who has produced this report on a voluntary basis.